This lesson continues the study of forest invertebrate studies and includes a description of equipment for field studies as well as a description of techniques for collection and census of invertebrates inhabiting grass, tree crowns and shrubs, as well as flying invertebrates. This field study continues the study of invertebrate animals found in different environments. The first part of the lesson describes the procedures for collecting and censusing insects in the forest litter and wood. Students will learn procedures for collection and censusing of invertebrates inhabiting the grass layer, and tree crowns, as well as flying invertebrates. The introduction of the field study is devoted to general rules of entomological studies and general provisions for procedures of collection and census of invertebrates found in the previous lesson devoted to this topic. First, students will learn the different types of habitats of invertebrates and the corresponding ecological groups. The following habitats are found within a forest: soil, forest litter, grass layer, wood (trunks of trees and stumps), crowns of shrubs and trees and the surrounding air environment. Field studies are organized in accordance with this structure; each of these habitats is investigated consecutively. When preparing for this activity, students should be reminded of the general rules of invertebrate collection, as well as the main techniques and instruments for their collection. We recommend discussing in more detail the ecological groups of invertebrates found in the habitats under study – grass layer, tree crowns and air environment, as well as techniques and instruments of animal collection in these environments. Practical studies should begin with a lesson devoted to mastering techniques of censusing and collection of invertebrates in grass, tree crowns and in air. 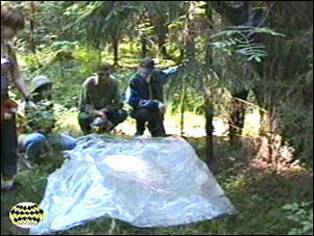 The whole group works together during this introductory field session to conduct “demonstrative” censusing following each technique in one of the typical biotopes in the immediate vicinity of the school or field studies center. The main part of the field research is organized in the following way. The group of students is divided into working teams of 2-3 persons and each team is given an assignment – to study a different biotope within the area under study. When studying a grass layer, habitats can include different types of meadows (for example, a dry meadow at watershed sites and a floodplain meadow), clearings in a forest, agricultural lands, etc. While studying tree crowns they can include crowns of different tree and shrub species or crowns of the same plant species growing in different plant associations, or biotopes. As for the air environment, the diversity of habitats of flying insects is rather high. It is possible to compare forests and open biotopes, natural and urban landscapes, areas at different distances away from a water body, etc. In regard to techniques for catching and censusing flying invertebrates, it is possible to limit students to two simple methods: a relative route (visual) count of day butterflies and a night census with the help of a light trap (see below). Other techniques for catching flying invertebrates can be used at the discretion of the teacher based on the availability of “student power” resources and time.